Making Peach Pickles today (see the recipe from “So Easy to Preserve” below) because that is one does this time of year when you have green peaches and don’t want to wait for them to ripen because you MUST can something! 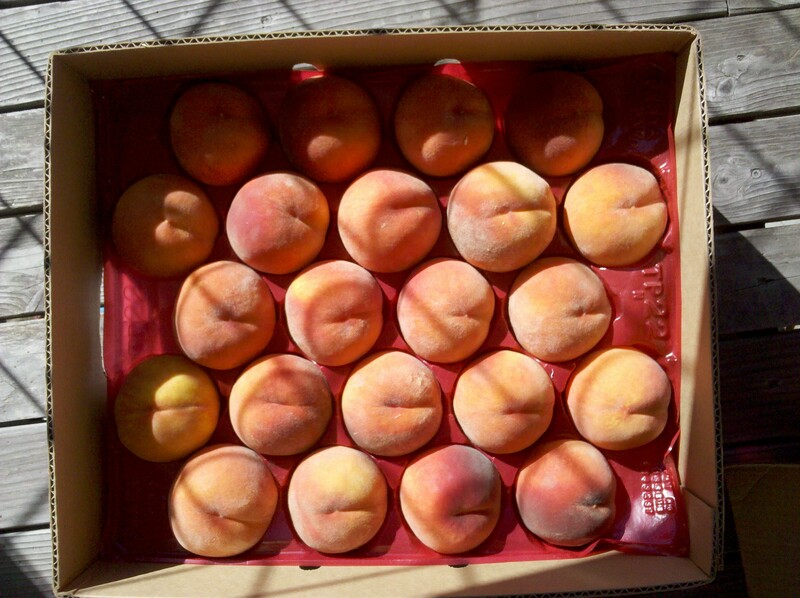 Method: Wash and peel peaches with a sharp knife, and drop into a cold solution of ½ teaspoon ascorbic acid and 2 quarts water. Dissolve sugar in vinegar in saucepot and put on range to heat. Boil 5 minutes and skim. Add spices (tied loosely in cheesecloth). Drain peaches. Drop drained peaches into boiling syrup and cook until they can be pierced with a fork, but are not yet soft. Remove from range and allow peaches to set in syrup overnight to plump. Bring to a boil and pack into hot jars, leaving ½-inch headspace. Cover with syrup, maintaining the ½-inch headspace. Remove air bubbles. Wipe jar rims. Adjust lids. Process 20 minutes in boiling water bath. Yields about six pint jars. If the bridge club is clamoring then this is something that I MUST make! It seduces and entices me – I can envision the pork roast on a beautifully appointed table with a gleaming jar of beautiful golden pickled peaches bringing a bit of sunshine to a dark winter meal. Oh, wait, that is just what the blog post will look like!! The reality is quite different – at least at my house! I also recognize that however glamorous and attractive the cookbook or blogger makes a dish or recipe sound, if it isn’t safe for my family then I want nothing to do with it! WSU Food Safety trained me – vigorously I might add – in safe and appropriate procedures to preserve all manner of foods at home. I am anointed by The Mother Ship (WSU Pullman) to provide information and answer questions about all home preservation and food safety issues using APPROVED MATERIALS. These are defined as anything that was tested for safety (for processing time and preservation method) by the National Center for Home Food Preservation or any Extension program dated 2010 or later. We are not able to teach classes or certify volunteers in a Master Food Preserver program because our office (WSU Kitsap) does not have a food science or food safety faculty member on staff. Right now there are only four counties with a food safety faculty member – which is about par with the rest of the nation. Shifting priorities within the national land grant university system in general and extension programming in particular 15-20 years ago moved resources from traditional home economic and natural resource faculty (food safety, clothing and textiles, agriculture) into economic development and youth and family since folks weren’t cooking, canning, sewing, and farming as much as in the 40s and 50s. Like all large institutions this change took place slowly and over a decade or so and was combined with regionalization of programming in an age of cost cutting, changing the face of extension considerably. So, what are you to do if you have a question about a recipe or need food preservation or food safety questions answered? Extension is online and here to help! Check out the WSU Kitsap Food Products page for links to all of all the extension publications containing safe and tested recipes for a wide range of home preservation. Check out the National Center for Home Food Preservation for recipes and tips. Or, give us a call at 360-337-7026 and leave a brief message. We will get back to you within 24 hrs if possible. If you are right in the middle of a project and need help NOW you can tap into the resources of our neighbors to the south and call the OSU Food Safety/Preservation Hotline at 1-800-354-7319. It is staffed from 9 a.m. to 4 p.m. on Monday, Tuesday, Thursday and Friday from July 15 to Oct. 11. In 2012 they responded to about 3,500 calls from consumers!